How to watch Faces Places (2017) on Netflix Taiwan! Sorry, Faces Places is not available on Taiwanese Netflix, but you can unlock it right now in Taiwan and start watching! With a few simple steps you can change your Netflix region to a country like United Kingdom and start watching British Netflix, which includes Faces Places. We'll keep checking Netflix Taiwan for Faces Places, and this page will be updated with any changes. 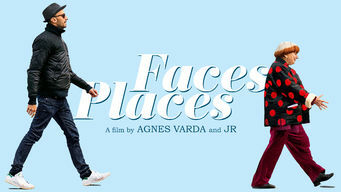 Faces Places is not available in Taiwan BUT it can be unlocked and viewed! French New Wave director Agnès Varda and muralist JR travel all across France, plastering giant portraits of people they encounter along the way. He sports shades like Godard. She has blurry vision. On barn walls, rail cars and rocks, they both see epic canvases. There is a way to watch Faces Places in Taiwan, even though it isn't currently available on Netflix locally. What you need is a system that lets you change your Netflix country. With a few simple steps you can be watching Faces Places and thousands of other titles!